If you are a big fan of Disney, you probably like to incorporate it into your holiday decorating. 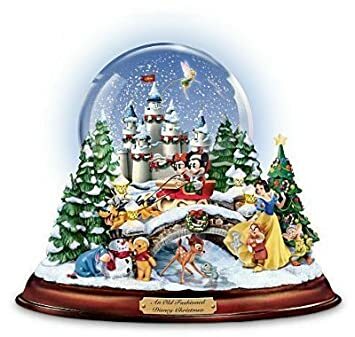 While you may have a vast collection of Disney Christmas ornaments, chances are you might not be aware of all of the collectible Disney snow globes the Bradford Exchange offers that feature the characters you know and love. 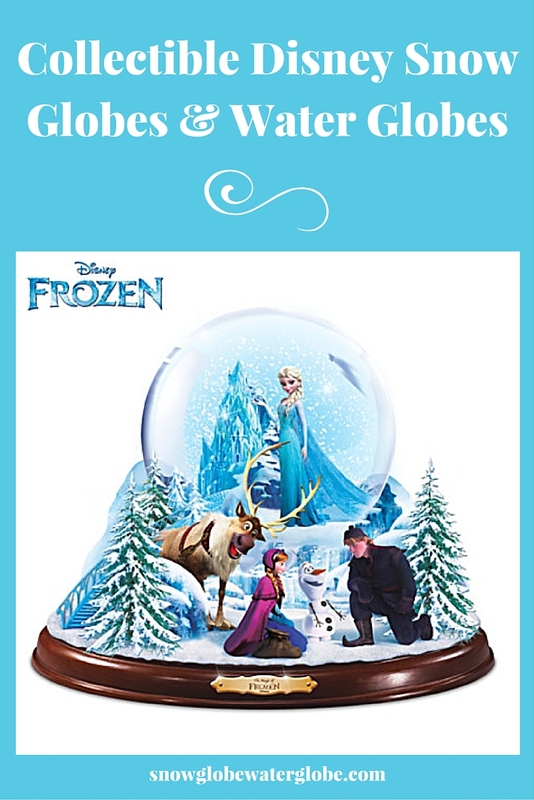 These snow globes make the perfect collectibles for Disney lovers, and will become a cherished gift that will last a lifetime. Year after year as the holiday season approaches and boxes are brought up from the basement or down from the attic, the recipient will remember when they received this special gift and whom they received it from. What a great way to created joyous Christmas memories, while at the same time adding to your or someone else’s collectibles. This snow globe depicts a winter scene with Mickey and Minnie Mouse riding over a small bridge in a sleigh with Pluto as their reindeer. Off to each side are snow covered pine trees, with one decorated for Christmas. Winnie the Pooh and Eeyore are building a snowman, while Bambi and Thumper slide on the ice of the frozen pond. Snow White and two of her dwarf friends have decorated the tree for the holidays. Goofy and Donald Duck are featured on the back side of the base. The water globe portion is slightly elevated on the base and features a beautiful castle with Tinkerbell flying around inside. Snow is activated by flipping a switch, and snowglobe also plays eight different holiday melodies. Snowglobe is handcrafted and hand painted. Measures 6 3/4 inches high by 7 3/4 inches wide by 7 1/4 inches in diameter. 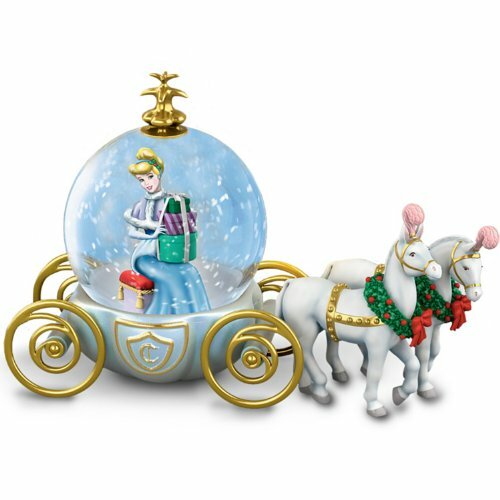 This is a handcrafted miniature holiday snowglobe featuring Cinderella in her carriage being led by two horses decked out for the holidays. 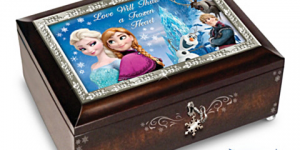 Cinderella is holding packages on her lap while the snow swirls around her. This piece is part of a collection that is available through a subscription plan from the Bradford Exchange. Snowglobe measures 3 inches high. 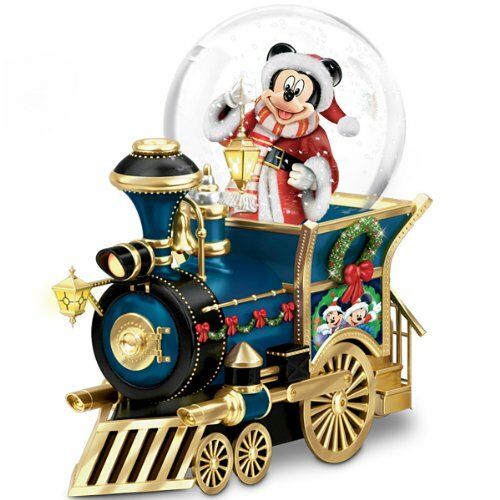 This snowglobe features a blue locomotive with gold and black accents. Locomotive is decorated for Christmas and is carrying our friend Mickey Mouse who is dressed up like Santa Claus. Actual water globe area contains Mickey, while the rest of the locomotive is outside of the water globe area. Piece measures 4 1/2 inches wide and plays holiday music. Piece may be purchased separately or as part of a collection available through a subscription. If you are a big fan of Disney, you probably like to incorporate it into your holiday decorating. While you may have a vast collection of Disney Christmas ornaments, chances are you might not be aware of all of the adorable snow globes the Bradford Exchange offers that feature the Disney characters you know and love. 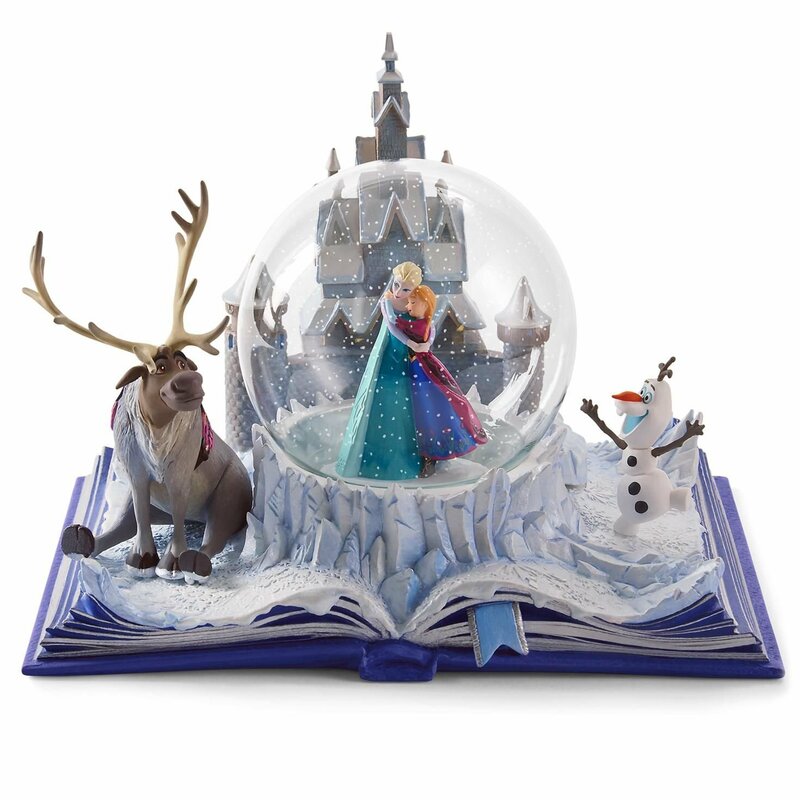 These snow globes make the perfect collectibles for Disney lovers, and will become a cherished gift that will last a lifetime.